When I first saw the cover of William Shakespeare's Star Wars: Verily, A New Hope flash across Twitter a few years back I had two thoughts: the first was "This is blasphemy, and it must be stopped!" The second thought: "This must be a work of either genius or madness--either way, I must have it!" 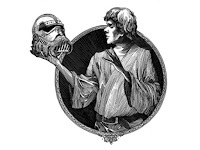 Ian Doescher's adaptation of George Lucas' original Star Wars screenplay to be in the style of the Bard of Avon has moments of genius, and moments of madness. I will say that for most of the time I was reading it, I had a stupid grin plastered on my face. Because (this is my usual line about these series ((also The LEGO Movie))) it was better than it had any right to be. Doescher could have written a sloppy mashup of Star Wars and Shakespeare, and it would have sold well enough. But what he's done is create art. Rewriting one of my favorite movies as a five act Shakespearean play could have fallen completely flat. I love Star Wars. If you know me at all, you know this. In 1977 my DNA was overwritten, and I'm at least 22% Star Wars at any given time. My handle on every friggin social media is JediKermit. I'm that kind of nerd. You know this. What you may not know is that I love Elizabethan English, whether in the form of Shakespeare's plays or the poetry of the King James Bible, I genuinely love it. I was worried that Doescher's treatment of the language would be poorly-written, or unnecessarily cluttered. Instead, what he's done is take George Lucas' script, translate it into iambic pentameter (really! ), and discover more depth and meaning to key scenes and characters than I would have thought possible. I mean, I know Luke Skywalker, Darth Vader, Obi-Wan Kenobi and Princess Leia better than I do my own parents. (Happy Thanksgiving Mom and Dad!) I know their biographies, their passions, their fears...what could Ian Doescher possibly bring to the dejarik table that I don't already have? Turns out, a lot. Each major character gets asides and even soliloquys that I love--some of those are expected, and just flesh out the characters. Some are for comedy's sake--Han Solo gets most of those. What Harrison Ford may have expressed with a facial expression or body language is written out here as an aside, thrown with a wink or a sneer at an audience that isn't actually there. This formatting as a play will be a barrier to some readers, even more than the four hundred year old language is, but I love it. Doescher uses stage directions and these asides and soliloquys to add new layers of depth to characters that don't interfere with, but enhance our heroes and villains. And now have I too much of my desire. Unto a thousand thousand varied paths. Have they been cruelly kill'd for what I want? The wanting all I love shall be destroy'd. I'll cut Luke off there. On the screen, what we saw was Luke standing near his burned home, the smoking remains of his family. The next scene, he's back with Ben Kenobi and the droids, and is clearly upset, but pretty much says "saddle up, Imma be a Jedi!" This scene at least gives him a few minutes to mourn his aunt and uncle and their blue milk, and summon the courage to go on to Alderaan. 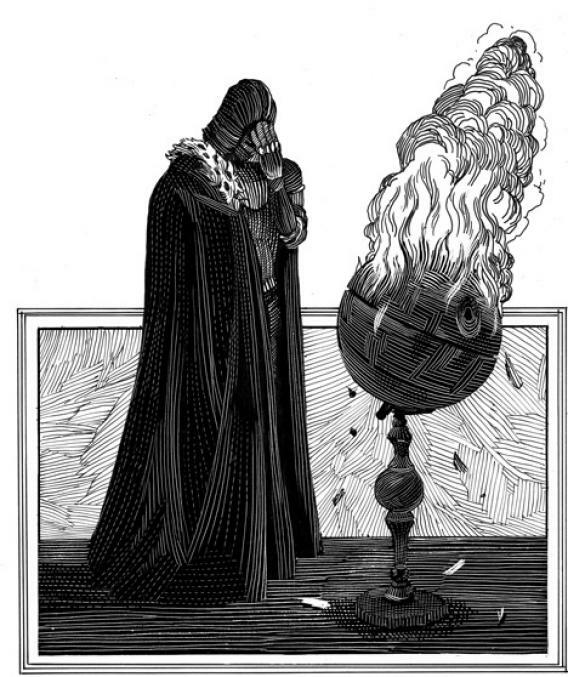 The book is richly illustrated by Nicolas Delort, who combines elements of Star Wars and Elizabethan dress in woodcut-inspired black and white drawings. So we have Grand Moff Tarkin in a high collar that accentuates his already gaunt features, and Darth Vader with a medallion seal of the Empire on his chest, and a fur-lined cloak in waves around his armored doublet. 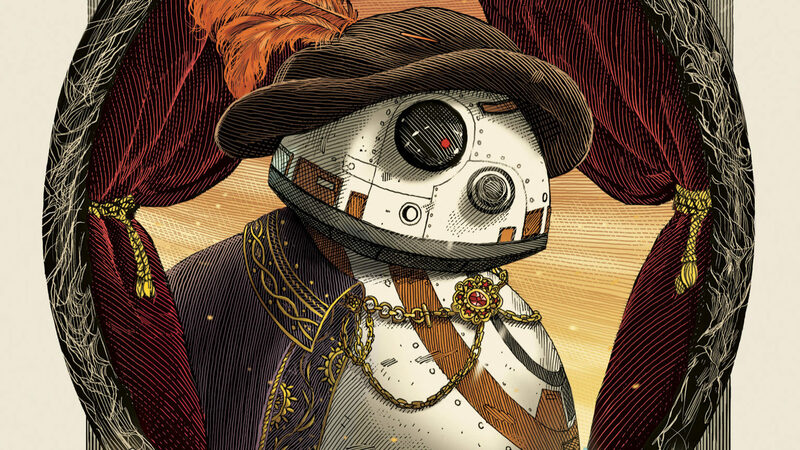 Jabba the Hutt sports a feathered Italian cap, and Han Solo wears knee-length breeches. We get pieces of how the sets could be designed and how the plays could be staged, which is another thing that boggled my mind. How would a play based on such special effects-intensive movies even work? I hope someone is thinking about these issues right now. Like Shakespeare himself, Ian Doescher has taken a great idea (if not a new one) and run with it. 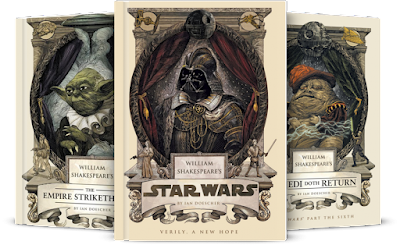 I won't say that it's greater than the sum of its parts, but "William Shakespeare's Star Wars" has made me consider that galaxy far, far away in a new light. And I'm grateful for it. The subsequent books in the series are as good, and each has brought new depth to something that I didn't think I could understand better than I already did. In The Empire Striketh Back, there are two particularly poignant passages. One from Lando Calrissian, being torn between betraying his friends and letting all of Cloud City fall to Darth Vader. I've never quite forgiven him for this crime...after reading this take on his character, I finally get it. What may not have come across in the film for lack of time was brought home to me by this project, which I know at least eleven of you are going to dismiss out of hand. But if you're one of those eleven, you haven't read this far. So unclench a little and enjoy life, man. It's too short. The other mindblowing, heartbreaking, and incredibly funny soliloquy in Empire is from that giant space slug who lives in the asteroid? The one the Millennium Falcon is hiding in and then has to fly out of? And it's like GNOOOMP ROAR even though it's in the vacuum of space and our heroes fly away and the Exogorth for lo verily that is its name ruminates (ironically, because ruminate is also TO CHEW but he's got nothin but vacuum)...that space slug gets his own page to mourn his loss, his hunger, his loneliness. GAH I love this series so much. DID I MENTION THAT YODA SPEAKS IN HAIKU?? Look, I could rattle off a few ideas for what I would do with this if I were teaching a Shakespeare unit. I'd have kids read a few of the most famous Star Wars scenes, ones that pretty much everyone knows even if they've never seen the movies. "I am your father," etc. You could have them do a side-by-side comparison with the script from the movie and Doescher's re-writing of it. You could have them reverse engineer Doescher's script into what they think the original language was, and then compare that to the movie. I'd have them take a few minutes of their own favorite movie or television script and try their hand at turning it all Elizabethan-like. I mean, I could. I could put five solid quick ideas in a little paragraph like that. Instead, I'll point you to two other places. First, is Quirk Books' own website, where they have study guides for the books in the series, but also a fully-fledged unit plan that's extensive and mindblowing and any single part could be used pretty much as-is in your own class. The other is Star Wars in the Classroom, an ongoing project that's collecting lesson ideas, camaraderie, and resources for bringing Star Wars into various parts of your curriculum at every age level and content area. Always worth checking out. They're good people.